EPIC brings together patients and care workers with digital experts. Through talking to each other we can create new ways to improve health and well-being, by using technology. Dynamo Healthcare Academy is a small academy delivering qualifications in health and social care, as an alternative to college and they aim to support students to be work ready when completing their study, through simulation, voluntary placements, and apprenticeships. Dynamo are interested in new care techniques, equipment and advances in technology within the health and social care sector and its applications to care delivery and education; every year they run a Health and Wellbeing Promotion Day for various secondary schools to bring along year 10 and 11 students, and open to college students who are interested in the sector and the various careers. 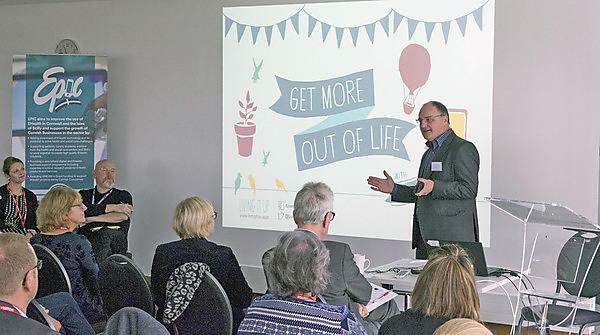 The first EPIC project conference was held on 1 November 2017 at Truro’s Health and Wellbeing Innovation Centre with the team delighted to welcome more than 120 people who attended the event – including representatives from the county’s major health and social care organisations and the clinical community and participants from the original workshops. The conference also saw the launch of the project's £600,000 Challenge Fund which will be used to help Cornish companies tackle the challenge identified within the eight project workshops held across Cornwall in September 2017. For more information about the event, and to download copies of the programme and presentations made on the day, please follow the link below. The evolving role of user experience (UX) in the development of digital health and care applications: current trends and future directions. When: Wednesday 10 October 2018, 13:00–14:00. UX plays an important role in the development of successful eHealth applications. In this webinar, we gave a quick overview of the essentials of UX testing for digital health and care applications, current trends and future opportunities. We shared the results of a recent scoping review and discussed the availability of local UX resources and expertise in Cornwall and Isles of Scilly. This webinar was aimed at a broad audience of health and care professionals, patients as well as eHealth developers. After hitting the 18-month mark of the project, and to celebrate our progress so far and thank people from across Cornwall and the Isles of Scilly who have contributed to the EPIC project, we used this session to look to the future and focus on our theme ‘A Cornish eHealth Ecosystem in the making?’ which harnessed our collective ambition, discussed how we will make our eHealth environment sustainable and support further collaborations. Digital innovation matchmaking – A session to link stakeholder project ideas to technology innovators, creating new projects that can access the EPIC Challenge Fund. A session on funding for eHealth innovation - for companies, health and social care organisations and collaborations. This was the first of a series of webinars for the eHealth Productivity and Innovation in Cornwall and the Isles of Scilly (EPIC) project. This gave an overview of the project including a commentary by Anna Mankee-Williams from Falmouth University. This was very similar to the first webinar (so was not recorded), giving an overview of the EPIC project including a commentary by Anna Mankee-Williams from Falmouth University. This explained the EPIC project but in particular looked at the involvement of SMEs. It included presentations by Paul Upton (Ultramed), Robert Salvoni (Bluefruit and Software Cornwall), and Joanne Evans (Creative England, part of the EPIC team). After an update on the EPIC project this webinar focused especially on General Practice and included presentations by Dr Rehan Symonds (Oak Tree Surgery) and Nigel May (East Cornwall Patient Participation Groups). Webinar five focused particularly on eHealth at Royal Cornwall Hospital Trust and featured presentations by Frazer Underwood and Simon Goodwin. Katie Edwards from the EPIC team gave an update on the local workshops held across Cornwall during September. This was the last of this series of general introductory webinars about EPIC. A new series of webinars run by Creative England aimed at SMEs will be starting soon – find out more information. The main focus of webinar six was the use of eHealth by Cornwall Partnership Foundation Trust, and the use of eHealth in the community. Speakers included Dr Rohit Shankar.